Radical Waters (Pty) Ltd, innovators in Electrochemically Activated Water (ECA) solutions and leaders in the ECA CIP beverage industry and its application, have partnered with and signed an OEM agreement with Envirolyte Industries International Ltd. in Tallinn, Estonia. Radical Waters and Envirolyte have combined their expertise and developed an ECA device specifically for CIP in the beverage industry. “As corrosion concerns, simplicity and reliability of the ECA device are key concerns of beverage customers, we have created a robust device to achieve optimal efficacy, low salt, reduced residual chlorides, thereby eliminating any concerns of corrosion,” says David Friedland, Managing Director of Radical Waters. 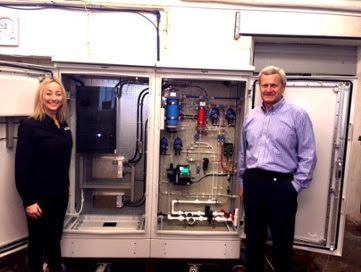 Envirolyte have over a decade of knowledge in manufacturing ECA devices and patented reactor cells for a range of applications, and Radical Waters has developed and patented many applications. Radical Waters has been able to successfully penetrate the beverage market on a global scale, taking advantage of its IP in CIP beverage in various countries. “We see Radical Waters as a well-established Company, specifically with profound knowledge in the CIP market and its application protocols, having many successful installations with world leading companies in beer and beverage. Our understanding and vision is that by combining our technical strength with the Radical Waters application, sales and marketing expertise, we can create a new synergy for the CIP market and continue to come up with more advanced products that better serve the customer,” states Valeri Ilchenko, CEO of Envirolyte Industries International Ltd.
ECA is familiar in the beverage industry, and known to offer its clients a safe and competitive alternative to traditional CIP chemicals. While there are many versions of Anolyte available in the market, Radical Waters and Envirolyte have created a highly specific range of ECA solutions that are tailored specifically for the Beverage industry. This new ECA CIP range falls under the new brand of Radical Waters N.O.W (Neutral Oxidant Water) Impact range of ECA devices. The N.O.W impact range is currently available in 100, 200 and 300 litres per hour of concentrated Anolyte and Catholyte respectively. Being remarkably simple in design by comparison to previous models, Radical Waters anticipate that the cost of these devices will be reduced by around 30%. 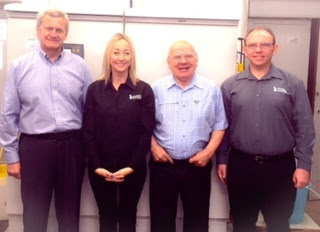 (Pictured: L-R, Nikki Wilson and Valeri Ilchenko in Tallinn, Estonia, with the N.O.W Impact Beverage Device, inside view of electrical and hydraulic cabinets). The technical characteristics of the solutions in terms of product efficacy are a competitive 500ppm FAC (Free Available Chlorine) for Anolyte and 1000ppm NaOH for the Catholyte, which is produced on-site and on demand. This entry was posted in Industry Articles, Press Releases. Bookmark the permalink. ← Radical Waters Granted Additional Beverage Patents in the Philippines.